Nothing is more useful when it comes to changing your baby's diaper than a changing table. It allows you to change your baby while standing in a comfortable position instead of hunkering down on the floor to give them a fresh diaper. It also gives them a comfortable place to lie. In this guide, we will take a look at five of the best changing tables on the market. There are a few types of changing tables that you should be aware of before making a purchase. There are freestanding changing tables that have a changing space on the top of the unit and open shelving for storing your baby's things underneath. Typically, these are the most popular type of changing table. The other common type of changing table that you could have in your home is a dresser top changing table. These are basically dressers where you can store your baby's clothes, but the top has a barrier along the edge of the dresser to ensure that your little one does not roll off of the changing table. There are also wall-mounted changing tables, but they are not typically something that a parent decides to use in their home. A Safe, Sturdy Construction: The safety of your baby is the most important thing to consider. You need to make sure that the changing table that you choose will be able to support them throughout their years wearing a diaper. With that being said, solid wood and durable materials are going to be the sturdy option when it comes to a changing table for your baby. Barriers: Again, with safety in mind, you need to make sure that the changing table that you get for your baby has barriers or guardrails to keep them from falling off of the changing surface. Some changing tables only have two barriers, but having a ledge on all four sides provides the best protection. Straps: When you get in a car the first thing that you do is buckle up, so when you put your baby onto a changing table that they could roll over and get hurt, it only makes sense that you should buckle them in as well. Changing Pads: The next most important aspect of a changing table is your baby's comfort. Pick a changing pad that has enough padding to protect their little body from the hard wood of the table. Also, remember that you are changing their diaper on this, so accidents are likely to happen. Make sure that the changing pad that comes with the changing table you purchase is easy to clean. The first changing table, which is the Delta Children Eclipse, is a durable option that is made from solid wood. It is designed with your child's safety in mind, which is why it meets all of the safety standards set by industry professionals for changing tables; in fact, it is also designed with a sturdy base so that it does not tip over with your child on it. There are four railings around the top of the changing surface to keep your little one safe, and there are two open shelves under the changing surface where you can store diapers, wipes, and anything else you may need. The changing pad is water resistant to make it easier to clean when accidents occur, and it also has safety straps attached to it to help secure your child. The feet of the unit can scratch the floor. This table can be uncomfortable to use for taller parents. If you are looking for a changing table that is going to be easier on your budget, then the Dream On Me Emily Changing Table is a good option to consider. It is designed to be durable as well, so it is made from solid cherry. The changing station is enclosed with a rail that encircles the entire unit. This railing is five and a half inches high so that your baby cannot roll off of the table. There are two shelves on the changing table as well that you can use for storage purposes. The changing pad on this table is designed to give your baby a comfortable place to lie, so it is designed with padding that is one inch thick. This changing table can be purchased in four different color variations, which include, natural, cherry, espresso, and white. This table has a sturdy design. It is easy to assemble this changing table. The finish on the unit looks nice, especially the white. The shelves are constructed from thin particle boards. The changing pad could be thicker. The Badger Basket changing table features a more modern design that will look great in any nursery. The frame of this table is crafted from solid wood to ensure its stability. In addition, there is a metal bar under the changing area to give extra support to your child. There is also a safety rail on all four sides of the changing surface. The changing pad that comes with this changing table is PEVA vinyl that can easily be wiped clean. It also comes with a safety strap so that you can feel a little more secure taking one of your hands off of your baby. Insofar as storage, this unit comes with three pull-out baskets that you can use to store items that you need to change your baby. It also comes with a larger hamper that you can use for dirty clothes. The hamper and the baskets can fold for easy storage if you prefer not to use them. It is a very sturdy table. It is very simple to assemble. The changing pad provides adequate cushioning. The strap to secure your baby is not that long. It might be uncomfortable for taller parents to use. The Delta Children Infant changing table is another sturdy changing table that you can select from. 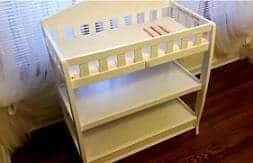 It is made from solid wood, the top is encircled with railings for your child's safety, and the paint on the unit has been tested for lead and other toxins. The changing pad is designed for comfort and convenience so it has plenty of padding, and it also has a water resistant design. In addition, the pad includes a safety strap to keep your little one secure, because it only takes a second for them to fall. This changing table also has two shelves that are designed for storage as well. This changing table can be purchased in four different colors including black, white, dark chocolate, and espresso cherry. This changing table is sturdy. The assembly instructions are vague. The shelves seem to be thin. The Graco Lauren changing table is one of the more unique options on this list because of the simple fact that it is on wheels. This allows you to move the changing table to a different room in the home to make sure that your crying baby does not wake everyone else. The wheels do lock, so you do not have to worry about the table moving when your baby squirms. It is made from solid pine so that it has a solid construction. The finish is non-toxic for your child's safety, and the changing surface is designed with guide rails to keep them from falling. The changing pad that comes with this table is made of a vinyl material that is waterproof, which means that if your child has an accident, it can simply be wiped clean. It has a lot of storage space. It is made from very durable materials. The changing pad is thin. When choosing a changing table, safety and functionality are the most important things to consider. All of the changing tables that we reviewed are great options for your nursery needs, but the one that really stands out the most is the Badger Basket Modern Changing Table because it has all of the safety features that you'd want as well as some hidden storage spaces and a hamper for your child's dirty clothes.